So I entered a pie contest this past Fourth of July. If you have known me long enough, you have probably figured out that I am not a baking kind of guy, nor am I one that is big into desserts. However, my kids are all about the desserts, and my daughter in particular is one who is really into fruit, and fruit pies for that matter. So it was last year that we were up at our local festival and that is when I found out there was a pie contest. A friend of ours actually came in first place, and that is what drove me this year to submit one. I’ve really been into blueberries lately and use them quiet extensively when I juice, so I figured that would be my pie, or the base of the pie that I would submit. As a side note, my pie did not win and I’m fine with that, but what I did notice is that I had a line in front of my pie, full of people just dying to try it. My pie was gone in a matter of seconds. I felt like a winner after all. 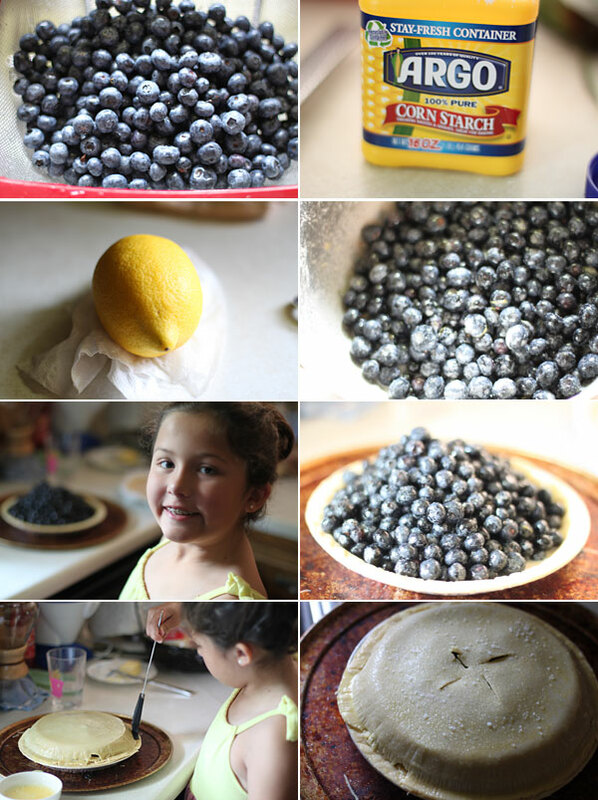 This blueberry and ginger pie was so good my daughter asked me to make another one a few days later, and so I did, but taught her how to make it. I was winning again. The great thing about this pie is that it is so simple to prepare. I will also admit that I included a couple of other items in my pie submission and I will keep those a secret until I win next year. Start by preheating your oven to 385 degrees. Next, add your cleaned berries to a large bowl and add in the ginger, lemon zest, lemon juice, sugar, cinnamon, and cornstarch. Gently mix to get everything incorporated. I used frozen pie crusts with my daughter, just thought I would let you know. Take one frozen pie crust, in its pan, and add in the blueberry mixture. Carefully place the other pie crust on top of the blueberry mixture, then using a fork, crimp the edges to seal the pie. Mix the egg and water in a small bowl. Lightly brush the egg wash mixture onto the pie crust. Cut a few slots with a sharp knife on the middle of the pie dough to allow steam to escape. Sprinkle the course salt and additional sugar on the top of the pie. Place on a baking sheet (as the blueberry mixture will escape), and cook for about 50-60 minutes. Once nice and golden, remove from the baking sheet and place the pie tin onto a plate to let cool. I like to place my pie into the refrigerator to let cool overnight. Obviously my daughter (and wife) could wait no longer. When you are ready, slice and serve. The pie just hits the spot. Maybe it is that bit of salt that cuts the sweetness along with the zip from the lemon. 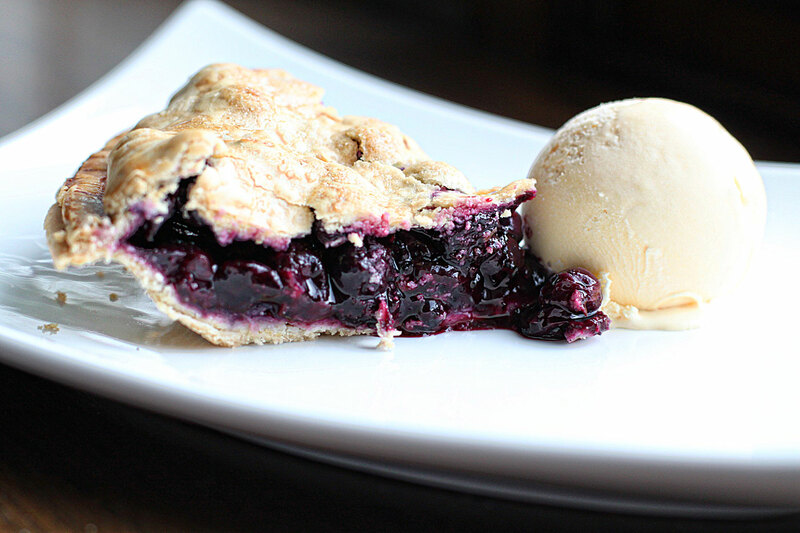 Whatever it is, this pie is special, and super delicious, especially on a hot summer day. Enjoy! Yummy … this pie looks deliciious! It combines alot of my favorite flavors! Just made this. DELICIOUS! Thanks for the recipe, and good luck at the pie back off this year. (I put in a pinch of cardamom as well).